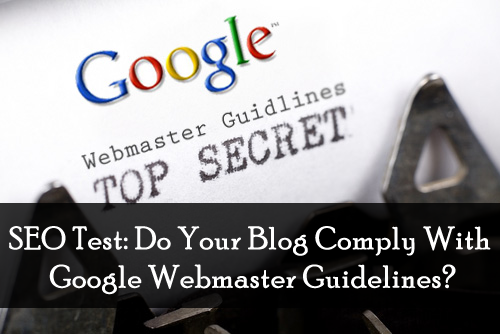 SEO Test: Do Your Blog Comply With Google Webmaster Guidelines? This is a Guest Article Written by Abrar Mohi Shafee – A passionate blogger who loves to do blogging, Especially for the beginners. Now-a-days, blogging and SEO are totally relying on each others. We do blogging and consider SEO processes to make the efforts successful. One simple question to you, what did you operate at first on your blog’s SEO campaign? Probably a good amount of people will answer, “Yeah, I submitted my blog to the search engines and the webmaster tools”. For sure, you went to Google before all. 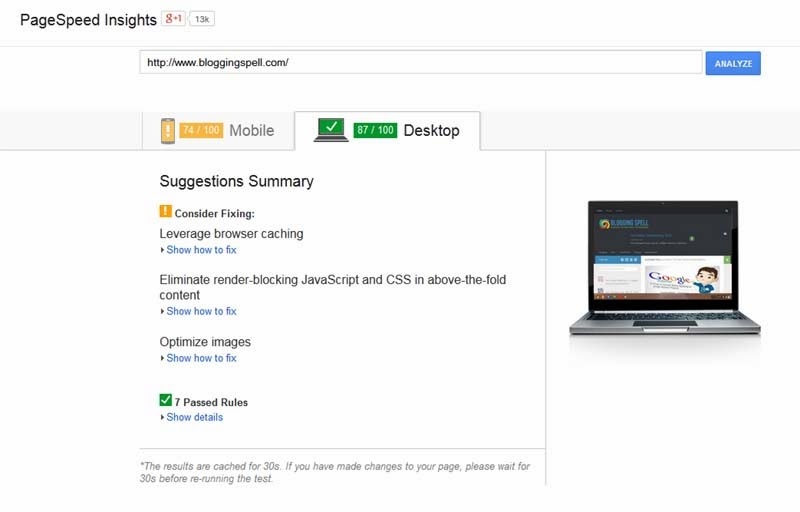 Just like me, you would have submitted your blog to Google Webmaster Tools. But did you ever check what they were expecting from your blog? You might not. Many times we experience problems from the webmaster tools. Even how good is your strategy, generally we see no effective result from them. Do you know why? It’s because Google couldn’t get expected stuffs from your blog. Do you know you will get higher priority from Google complying their own guidelines? It’s because Google loves to see blogs as per their recommendation. So I think following their guidelines would be the plus points to beat your search competitors. It is sure that all of your competitors won’t be friendly with the guidelines. That’s why it would be easy to simply outrank the competitors with some actionable guidelines. Let’s see how to make it happen. Before all, we have to make sure which elements are missing and what is to implement. 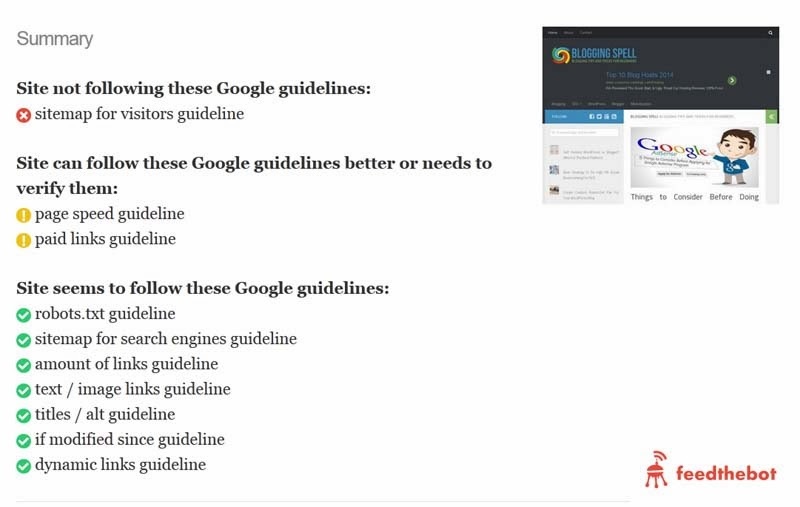 Google Webmaster published their own guidelines, but it would be really disgusting to check each element one by one. Why not we use an engine to detect the problems? Yep, there is an awesome resource what we would be happy to use especially in this case. And that is FeedTheBot. Here we can see that my site is almost complying with their guidelines. There is only one major priority to correct and that is sitemap for visitors. And there are two medium priorities, page speed and paid links. The rest guidelines are passed through my blog. So let me explain how I complied with the guidelines and the additional works, what I would need to consider. Blogs are intended to provide value to the readers through such quality contents. And that is what Google expected. They generally love blogs that are focused on serving the best to the readers. But unfortunately most of the bloggers misjudge their recommendation. The new generation bloggers think optimization is the first and the foremost thing beyond blogging. But I think that is exactly not. Yes, it’s true that without SEO there would be hardly visitors. So we have to get ourself involve into it after thinking about the visitors. We have to give higher priority to the readers and then the others. As Google wants, we also have to think about visitors at first. And then we should go for seo and other activities. You can see my page loads fairly well on the desktop, which could be more improved. My blog loads in less than 1 second. To pass on the FeedTheBot report, you may need 90+ marks there. But that is not necessary to have loading time in less than 1 second. I think loading speed in less than 3 seconds is enough for this purpose. However, you can improve more by following the recommendations by Google Page Speed Insight. Now you have to add two different sitemaps, one for your users and another for search engines. Both sitemaps are necessary in two different purposes. User sitemap provides better user experience with a collection of important links. Here you have to add your important pages where the readers could look and easily navigate to the pages. This type of sitemaps is called HTML sitemaps. And these are especially for users. I haven’t set up it yet. But I will do soon and will recommend you to do also. Search Engine Sitemaps are basically XML sitemaps which are created for helping the search crawlers. In XML sites, all the index-able pages are included. So the crawlers could easily look into it and quickly index the pages. That’s why it is necessary for the search engines. According to Google’s guidelines, both of these sitemaps are necessary. So we have to build two different sitemaps for two different purposes. In blogs, Robots.txt files are specified to control the indexing of pages. Sometimes we need to exclude a page from being indexed. So what we would do? The better solution is to noindex it through Robots.txt file. That’s why it is recommended by Google to specify which type of links should be indexed and which types shouldn’t be. Simply create a robots.txt file and you will be successful with this guideline. Generally Google couldn’t read what is written in an image. So they always recommend to use alternative text to the images. In order to add this, we have to add alt attribute to the img html tags. We have to add the most relevant text to the alternative text section to give an idea to the crawlers what the image is about. It plays an important role in seo as well. So it is necessary in all purposes. Google and other search engines can’t properly crawl dynamic urls. A dynamic url means a url with question marks (?) and other similar symbols. This type of urls are not friendly to both users and search engines. So the best practice is to avoid all sorts of dynamic url. Expecting good ranking in search engines, many people buy links which are supposed to be paid links. A few years ago, paid links have been strictly prohibited. Even, a site with paid link would be penalized. So make sure you are not among them. On the other hand, nofollow links are those types of links which don’t pass link equity. We especially use these for advertisements and other irrelevant links. Nofollow links are similar to paid links. So we have to ensure that the no-follow links are done for reasons. In the above report, there is paid link priority. But that is not a paid link warning. It’s because I have a nofollow link on my homepage. So the notification is to make sure that I am using it for reasons, not as paid links. We do SEO mainly targeting Google. So we must be complying with their rules and requirements. The requirements are not so hard, but implementing these would surely help you in any way. So I recommend you follow the basic rules I specified and I am sure you will see changes in your ranking. Wish you all the best for implementing the guidelines. Abrar Mohi Shafee is a passionate blogger who loves to do blogging for especially the beginners. He is the CEO and Founder of BloggingSpell.com. His expertise areas are blogging, seo, social marketing and web designing, You can follow him on his Google+. superb!! !Since past two Weeks i wondering about a one Best and Seo optimized Website which is on blogger platform.Because i notice most of success bloggers are from word press and their rank is under 1lack. Now i really inspired with you .Because your website has rank 28847 among the world.and its Google blogger platform. Yep, blogger is still a good platform to use. But I don't varies between platforms. Just go with what you prefer most. Apply all the recommended policies and you will be fine. There is nothing much differences between platforms but the differences are in your contents and working strategies. So, I wish you go with what you prefer to use. I have done great things. Hi Aniket, Kindly use our contact page to ask off topic questions. Glad to find your blog with Good information.